I’m out really early with Yankee this morning and though it is finally feeling like summer, it is still cool at this hour. 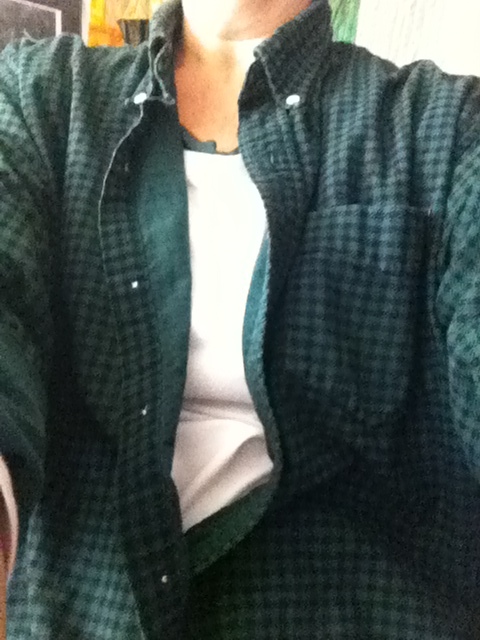 So I keep the green shirt I am wearing on. This green checked flannel shirt is my go to as a light but warm layer in these transitional seasons, and the one I slip on over whatever I am wearing to do chores around the house. I’ve been wearing this shirt for so many years now that I hardly ever think about it anymore, but for some reason this morning I do. I look down and notice that the nap of flannel is actually gone from the fifteen years I have been wearing and washing this shirt. The fabric is still thick and substantial while being completely soft at the same time. My thoughts drift to the other night making chicken wraps with collard greens instead of bread. Molly and I are going to a setting that wants a picnic and it is slim pickings in the house for picnic food choices. I’ve taken two chicken breasts out of the freezer and after a day of thawing in the fridge they are ready to marinate. So I make a marinade of slices of two large garlic cloves combined with equal parts fresh lemon juice, tamari, and olive oil. It’s all sitting in a bowl and I have no idea what I am going to do with them. Typically, I will grill or pan sear the chicken to slice for a big salad. I’ve been practicing eating this kind of protein, with is not very often, with just vegetables, no grain. I’ve discovered that I simply feel better eating this way. There’s no bread in the house anyway. There is however, a huge bunch of collard greens. What if the collard greens became the wrap for the chicken, which could be combined with some grated carrots and the leftover salad dressing? I choose six of the largest leaves and carefully remove the spine about half way up. Put a large skillet on the stove filled halfway with water, and bring to a boil. Add some salt to the boiling water. Then submerge each collard leaf into the boiling water, count to 10, remove it with tongs and put it on some paper towel to drain, amazed at how brilliant and soft each leaf becomes in this process. 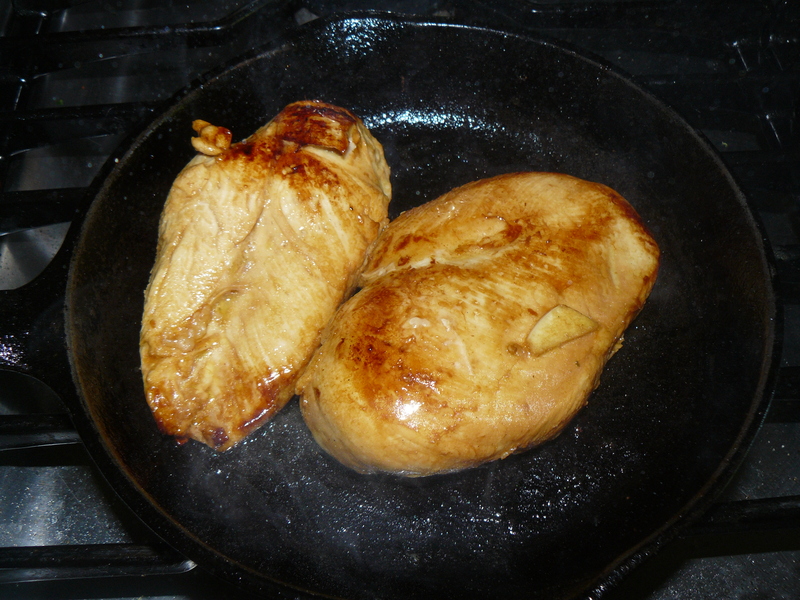 While they are cooling I heat some olive oil in the small cast iron skillet that is just big enough for both chicken breasts. With fire on high, add the chicken with the garlic and a bit of the marinade and sear them both sides. I see these gorgeous wraps and think, this is what sandwiches must have looked like in ancient times before there was grain and bread, cooked meat of some sort mixed with foraged herbs and vegetables, all wrapped in some sort of leafy green. At least this is what I am imagining. The actual eating experience later in the afternoon is not disappointing! We’ve brought heavy cloth napkins to use, thinking these sandwiches might be a bit messy, but I am pleasantly surprised at how easy they are to hold, and how easy it is to eat these wraps. Biting into the collard is actually a bit like biting into a good crusty piece of bread, a little chewy while still being soft, and a wonderfully light nutritious companion to the dense flavorful filling inside. 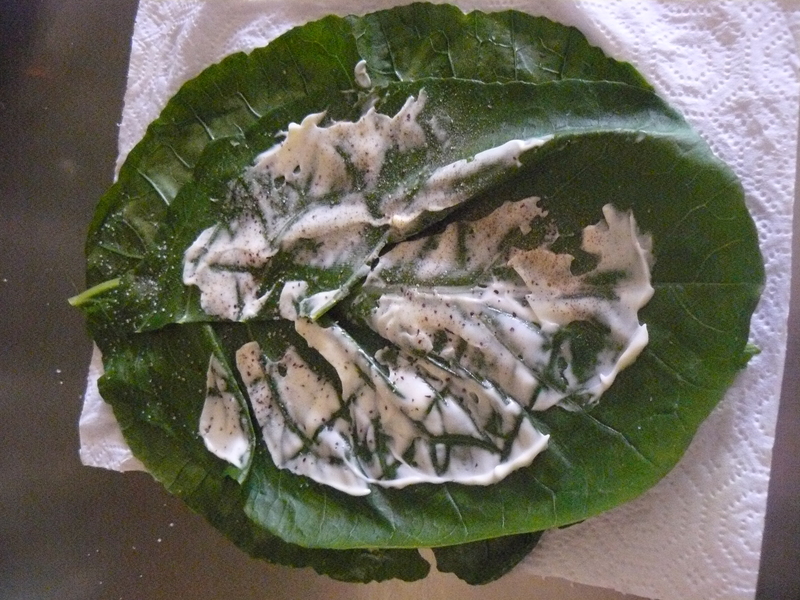 My imagination has come full circle…enjoying the nourishment that comes with finding this ‘ancient wrapping’…. This entry was posted in Uncategorized by Kathy. Bookmark the permalink. What an ingenious recipe! 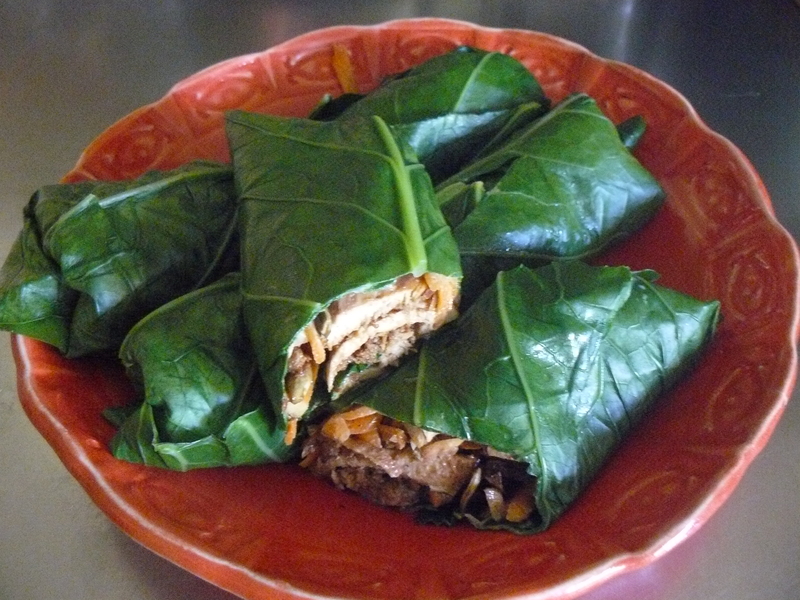 I grew up picking collard greens with my maternal grandmother who, though quite well-versed in making culinary delights with them, never once used these versatile greens as wraps. Being one who is gluten intolerant, I avidly seek alternatives to typical sandwiches, including the ubiquitous wheat wrap. So this healthy & yummy recipe will be added to my list of summer dishes! thanks Kent…just did a little update too…forgot to mention the pumpkin seeds added to the apple carrot mix…a key ingredient!! Oops … Cool. I will adjust! So inventive — and pretty!